We only discovered that Brooklyn has a winery because my mother spotted an article in the Times and emailed to tell me about it (thanks Mum!). This sounded like too good a thing to miss, and having now been there we can thoroughly recommend it. We began our visit with one of their free tours, during which we saw the vats in which fermentation takes place, the grape processing machinery, and stacks of barrels. 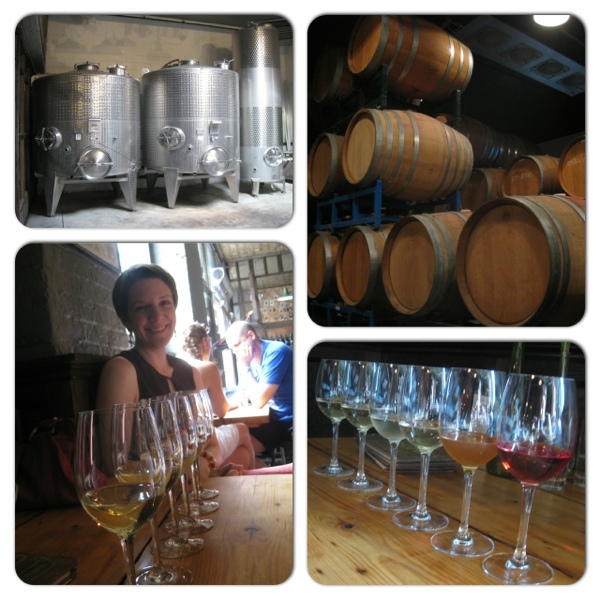 We also learned that they make wine from grapes grown in both California (understandably) and New York state (more surprising), and that they experiment with a range of styles, using both oak and steel barrels to bring out different flavours in the wine. Once the tour was over we headed back to the bar to taste some of the results! The winery has only been in operation for 2 years, so they have a fairly small range of their own wines at present, (their first reds are due later this year) and their wine list is rounded out with bottles from other producers, and complimented by a tasty-sounding menu (we didn’t eat anything this visit). We opted for a tasting ‘flight’ of 6 Brooklyn winery wines, all of which used New York state grapes: from left to right in the picture above these were stainless steel aged riesling, barrel fermented riesling, stainless steel aged chardonnay, barrel aged chardonnay, orange chardonnay (the grape skins are left in during fermentation), and rose of merlot. The staff were both knowledgeable and helpful, and talked us through what to expect from the wines, then left us to get on with comparing, contrasting and generally enjoying them all. My favourites were the stainless steel riesling, the orange chardonnay (which had a really interesting musty-in-a-good-way flavour) and the rose, but actually I’d be happy to drink any of them again. 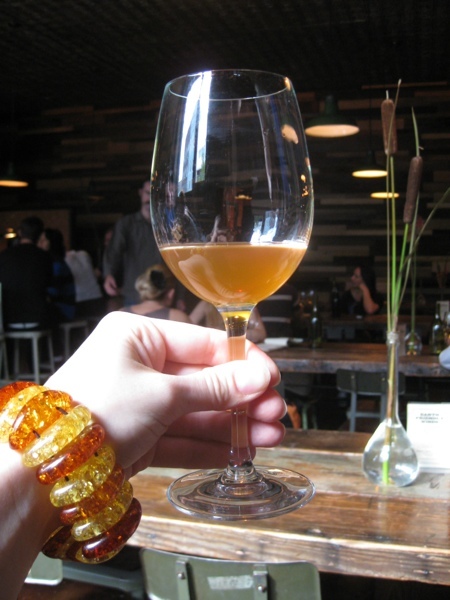 This entry was posted in Food and drink and tagged Brooklyn, wine by Emma Davidson. Bookmark the permalink.